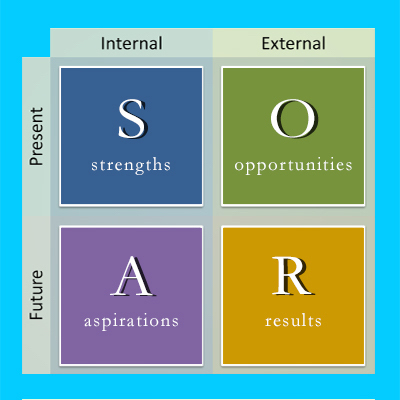 SOAR Analysis much resembles a SWOT Analysis. A SOAR Analysis is a tool to improve the strategic planning process and is best done in a group setting. I have a pet theme in the strategic thinking process: it’s to focus on outcomes, rather than outputs. You may think this is just a pedantic matter of semantics (want to read someone else’s opinion, try this short Harvard Business Review article. However, it’s absolutely not. When you are thinking about the future that you would like to see, do you think of piles of boxes of your products on the loading dock—or do you think about smiling customers getting value from your products. How is SOAR Analysis different to SWOT Analysis? The idea behind SOAR Analysis is to move from something that is static and just states how things are now—>to one that defines where you want to be. Strengths: What can we build on? Opportunities: What are our best future tracks? Aspirations: What is deeply important to us? Results: What will indicate that we are succeeding? I always stressed to participants in a SWOT, that they should concentrate on the Strengths and Opportunities, while later kicking the Weaknesses and Threats out of the way. Curiously weaknesses and threats are easier to confront. Identifying and understanding strengths and opportunities is much more challenging. What We Have or What We Want? However proponents of SOAR Analysis suggest that it is much more future oriented and will be more ‘can do’. My own feeling is that it might encourage groups to ignore things that are getting in the way of progress. We tend to be better at identifying the negative, rather than the positive. This is not to say that we’re pessimists—it’s just the way the brain works. In the article SOARing from SWOT, the authors draw four lessons every strategic plan must know. In this regard the Force Field Analysis has a good lesson. People have a tendency to be better at how to get rid of restraints than naming the positives. In addition, if barriers can be eliminated goals are likely to more easily achieved.